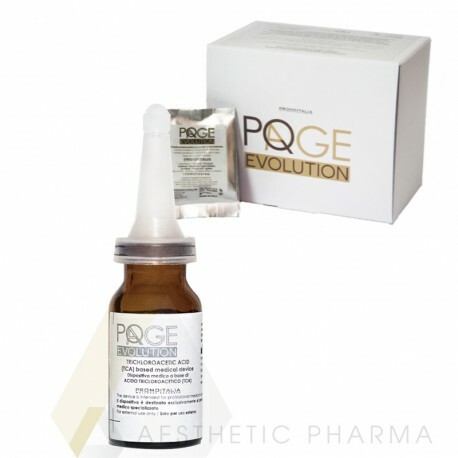 PQ AGE EVOLUTION – non-invasive scrub used for non-aggressive tissue regeneration. Peeling properties facelift, deeply nourishes the skin, stimulating it to interior renewal. Effectively combats imperfections, without causing any harmful side effects. The treatment PQ-AGE is an excellent choice for those seeking painless, non-invasive and quick way to beautiful and healthy skin. The treatment can be performed at any time of the year – even in summer – and combined with other procedures. Combination of acids, urea, peroxide, co enzyme Q10 is a very effective formula with a strong revitalizing effect, yet with none or minimal side effects (mild redness may occur but rarely). PQ-Age peel is a cosmetic procedure that gives an effect similar to mesotherapy. It is an excellent choice for those, looking for quick ways for beautiful and healthy skin without the side effects or exclusion from everyday life. Its innovation lies in that it provides a profound stimulation without affecting the surface of the dermis and epidermis without flaking. It stimulates the tissue for interior renewal and intensively regenerates the deepest layer of the skin in a very gentle way. Smoother and younger skin is visible immediately after the procedure. This is the perfect treatment, that improves the tightness of flabby skin and reduces discoloration of the face and body. The treatment is also indicated for the scars of different origin and acne scars. Very good results can be achieved using it for stretch marks. It is also suitable for sensitive skin – it fights skin imperfections without side effects. The skin is visibly rejuvenated, wrinkles are filled, discoloration is lighten and the complexion is radiant after only one treatment! Gentle massage is used for application. Depending on skin condition and the expected effect, this procedure is repeated every 10 days 4-5 times. The process is short and extremely efficient - about 20 – 30 minutes! glyne complex (DDB) - a natural complex based on an innovative muscle-relaxant polypeptide.